But it can certainly feel like a guessing game sometimes, when it comes to understanding how your content can effectively build leads and convert sales. You can’t just throw an infographic up on your site and expect people to want to purchase services from you immediately after that. Engaging your leads with solid content and guiding them towards purchasing from you involves a bit more strategy and planning than that. Not everyone is successful in creating lead-generating content, so understanding how your content marketing sales funnel works is crucial. After all, you might have plenty of qualified leads at your fingertips, but it’s reported that 50% of those leads aren’t immediately ready to buy something from you. Which means you need to find a way to nurture them, and content is a great option. To nurture leads effectively, you’ll need an understanding of who your leads and customers are, and the kind of information and content they actually want from you. Leads understand that they have a need that must be addressed, or they become aware of your product/offering. This is the stage of getting to know your company. Evaluation: Do They Like You? Your leads know about your product or service, and have been deciding whether or not you’re the right fit. They’re ready to buy and just need something to push them in the right direction. You can see, then, how the content you offer to one lead might look different from a lead in another phase of the buying cycle. Someone ready to purchase is very likely already aware of your website and blog, but a new visitor to your site will be interested in learning much more about who you are and what you offer. The messaging will need to look different. So when you are planning out your content marketing strategy, it’s crucial to understand your buyers and which stage of the cycle they happen to be in. Look at the entirety of the buyer’s journey – we want to guide them through this journey, from letting them know what you’re all about (the Awareness/Knowing stage) to purchasing from you. It takes time, and a good lead nurturing strategy, to get them to that point. 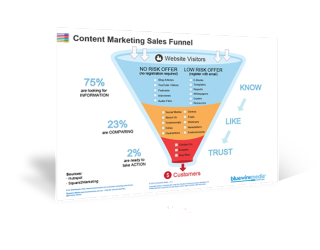 Bonus: Download the “Content Marketing Sales Funnel Template“ to help get people to know, like and trust you by nurturing them with the right information at the right time. If you download the template above and follow along, I can walk through the strategy and kinds of content that you’ll want to consider for each kind of lead that you’re nurturing. The funnel is organised according to the stage of the buyer’s cycle that a lead might be in. Your content marketing efforts will start with your website and the people who visit it, so this is the opening of the funnel. The other portions of the funnel coincide with one of the stages of the buyer’s cycle that we discussed above. In the “KNOW” section of the funnel, your leads are in the Awareness stage of the journey. 75% of your entire marketing funnel is sitting in the awareness stage. In this stage, your leads know about you, and they’re comparing you to their other options. Leads spend this stage deciding whether or not you’re the right fit for them. This stage is about building on the reputation that you have with your leads, and nurturing them so that they’re ready to buy. Only about 2% of all your leads are ready to buy at any one time. Let’s look a little more closely at these stages. It’s in this stage that your leads are just getting to know you. These site visitors are just starting to have an awareness of your website and what you offer. At this stage in the buyer’s cycle, you’re making sure to engage visitors in a conversation with you. That means offering them e-books or other resources that might be useful to them, or compelling blog articles that answer questions they have about your industry and services. You can offer these pieces of content with “no risk,” meaning they won’t need to register to read your blog or enter their email address to gain access to the content. Or you give them a “low risk offer,” and make content like whitepapers, e-books, and guides available, in exchange for their email address. Here’s a good example of what you might offer someone in the Awareness phase of the buyer’s cycle. They’re just getting to know you and what you sell – but maybe they’re interested in an e-book that you’ve made available. Square2Marketing’s site offers leads a free e-book when you register on the site. Clicking the “download” button here takes visitors to a registration page. Creating this kind of content – free, downloadable or shareable content that your visitors need and have searched for – will initiate the process of nurturing leads from awareness into evaluation. In the next phase of the funnel, leads are evaluating your business and are very likely comparing you with competitors. It’s here in this phase that you’ll want leads to understand you more and actually like you. Content has to continue to play a role in the lead-nurturing process – you can’t just push these leads towards a sell. Offer trials for your products. Have an extensive FAQ page on your site to help distinguish yourself from your competitors. Testimonials can also play a big role in this stage of the buyer’s cycle. This testimonials page from Bluebeam is especially effective, with video testimonials featuring actual customers. The final stage of the content marketing sales funnel is for the leads who know they want to buy from you and are ready to do so. That doesn’t mean it’s all smooth sailing from here – you’ll still want to be sure to have effective Calls-to-Action and forms that are easy to complete and submit. 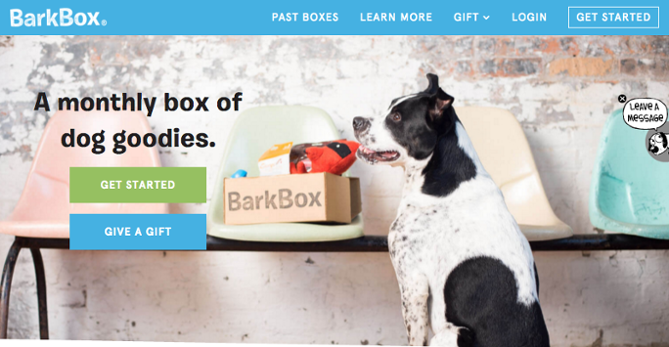 The page design should be attractive and the CTA should be compelling enough for visitors to click through and sign up. It’s understandable that you might not have all of these types of content available to attract leads – but if you begin building your library of content now, you’ll be prepared to nurture your site visitors and leads through the buyer’s cycle. It’s important to remember that you want to consider the entirety of the buyer’s journey when producing this content. You want to guide them from knowing who you are and what you offer to buying your products or services. Understanding where your site traffic is coming from and what people are clicking on your website is crucial here. Understanding your customers and what they are interested in downloading or purchasing means they’re going to be in a much better position to buy from you (and tell others about you). Because you are not rushing your leads through your sales cycle, and instead giving them content that is relevant for where they’re at in the buying process, you’re more likely to have happy, loyal customers over time.